Late 18th to early 19th century. 3-storey, 7-bay former granary. Random rubble; droved ashlar dressings. E (PRINCIPAL) ELEVATION: former door, converted to tall window at ground floor to outer right; door to 3rd bay right. Small, almost square windows to all floors; larger windows to outer bay left and 3rd bay left, with former hoist doorways at 2nd floor breaking eaves in wooden dormerheads. 3 small rooflights set close to eaves. N ELEVATION: 2 arched window openings (former cart entrances) with masonry blocking lower sections. Late 20th century timber balconies fronting sliding windows at 1st and 2nd floors (dormered at 2nd floor). W (REAR) ELEVATION: irregular fenestration (mostly small square windows); 5 unevenly spaced red-tiled dormers. S ELEVATION: door to right. INTERIOR: altered to form flatted accommodation (circa 1996). Timber tilt-and-turn windows; timber boarded doors. Pitched roof (gabled to N, piended to S); renewed red pantiles; straight stone skews to N.
Prominently positioned on a corner site by a coastal road, this former granary has been sympathetically converted to flatted accommodation in the late 1990s. 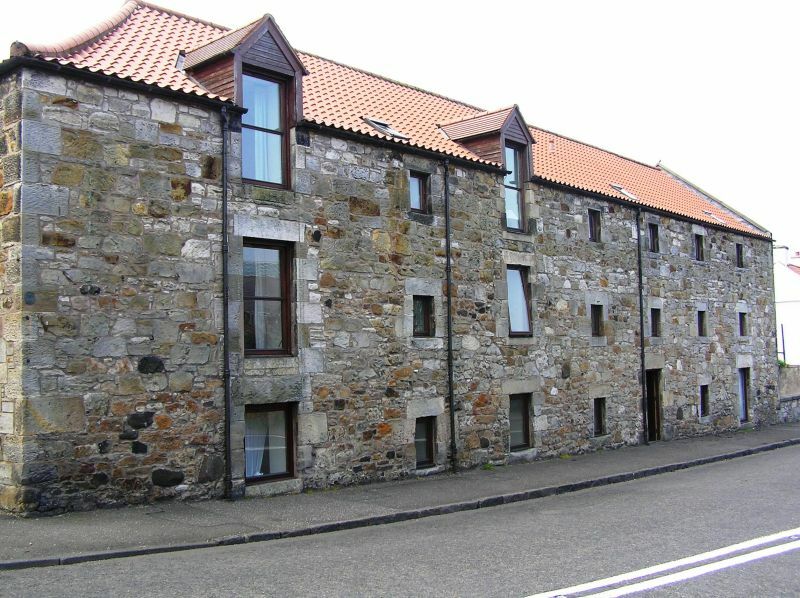 It was probably originally part of the extensive maltings of Mr Punton, referred to by Martine as sited in the Wynd and East end of Aberlady. A 2-storey, 3-bay outhouse to N (roofless in 1992) was demolished at the time of conversion.